Six Amerks Scored 20 Plus Goals, First time in Over 20 Seasons · Let's Go Amerks! There’s a lot of remarkable achievements for the 2018/2019 Rochester Americans in the regular season. They were third overall in the league, they had the best road record, and they also tied a franchise record for road wins in a season with 25. They also scored a lot of goals finishing third overall in the league with 254, one goal behind the Syracuse Crunch who finished with 255. The Amerks were also the only team in the American League with six players to score 20 or more goals. Syracuse had five with two of those players scoring over 30 – Carter Verhaeghe (34) and Alex Barre-Boulet (34). Toronto also had five players to score 20 or more with one scoring over 30 – Chris Mueller (33). Victor Olofsson was the Amerks leading goal scorer finishing with 30 goals in 66 games. He scored twice in his last game played before sitting out the finale. He earned a call up to the Buffalo Sabres missing six Amerks games. We can make a safe assumption he would have finished with over 30. The five other Amerks players with 20 or more goals: CJ Smith (28), Taylor Leier (22), Zach Redmond (21), Wayne Simpson (21), and Danny O’Regan (20). Over the course of 63 seasons there’s only been two times in franchise history that the team didn’t finish with at least one 20 goal scorer. The first was in 2014/2015 when the leading scorer was Zac Dalpe who finished with 16 goals. Four players finished with 15 goals – Daniel Catenacci, Johan Larsson, Tim Schaller, and Phil Varone. The second time was last year during the 2017/2018 season when Sahir Gill finished with 18 goals. Kevin Porter, CJ Smith, and Colin Blackwell all finished with 17. Enjoy Victor Olofsson in the playoffs. 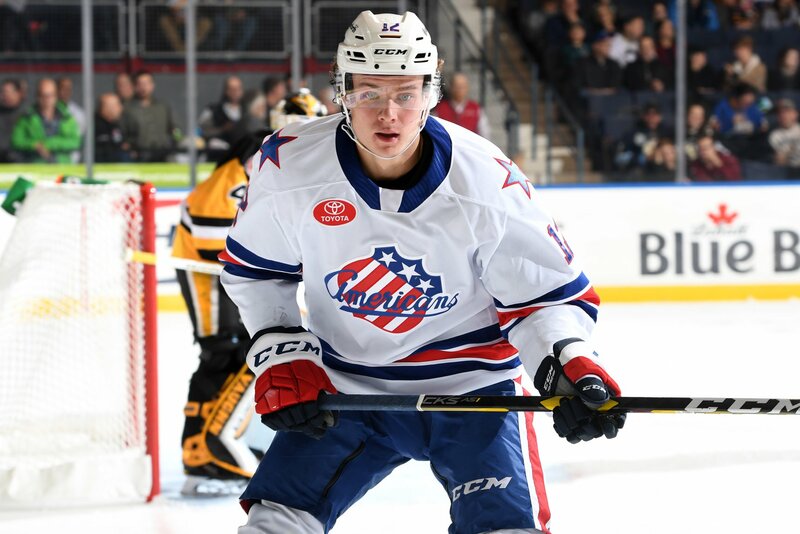 The games will likely be the last Olofsson will ever play in a Rochester Americans jersey before beginning a full time NHL career next season.